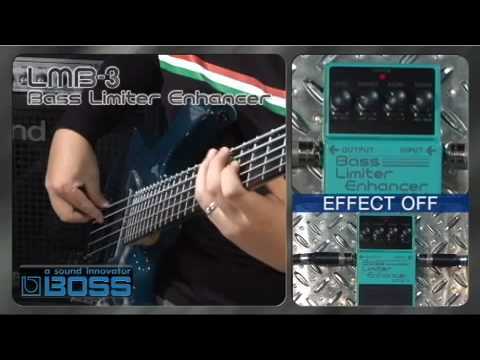 The Boss LMB-3 Bass Limiter-Enhancer Guitar Effect Pedal takes full control over the dynamic range by means of a limiter effect and an enhancer circuit. The LMB-3 is especially designed for an electric bass guitar to make your already wonderful-sounding axe sound even clearer, with the ability to cover a vast range of tones too. The LMB-3 cancels out any sharp peaks in volume so that no matter which technique you employ when playing the bass it will sound ultimately smooth. As we all know, Boss are masters at producing fantastic electronics and effects for electric guitars, and the LMB-3 is no exception. At your disposal are four controls: level, enhancer, ratio, and threshold. The level knob allows you to adjust and set the volume for a consistent, smooth bass output. Alongside the level control is the enhancer, which gives you sparkling trebles and intense, sharp clarity the more you turn it up. Next up is the ratio parameter which provides you with control over the compression ratio, thus regulating how much the limiter can compress the bass sound above the threshold. Lastly, the threshold knob lets you control at what level the compression can transpire. The LMB-3 pedal is works off a 9V battery with the additional option to use an AC adaptor, so that you can take full advantage of its rich, smooth bass sound. The Limiter-Enhancer provides you with a huge range of tones to experiment with, so whether you’re employing a dynamic pop and slap bass technique, the pedal will ensure that any sharp peaks in volume are eradicated for an all-round, clean sound. The Boss LMB-3 Bass Limiter-Enhancer pedal is compact and easy to use, and is sure to please any bassist whether you’re looking to improve your studio or stage presence and performance.